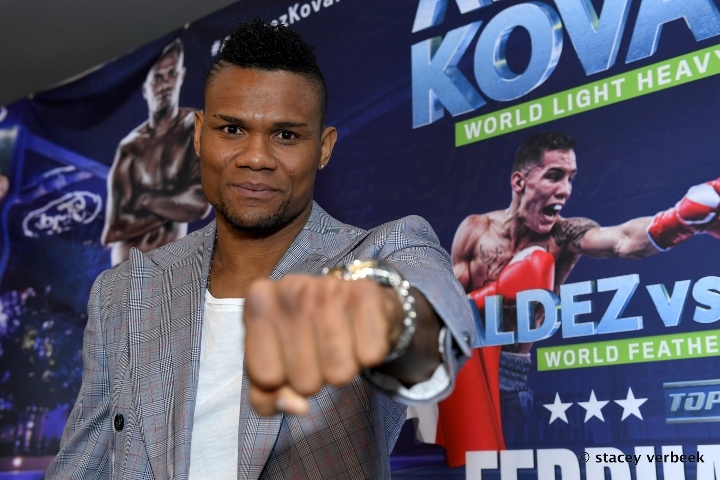 Last week an article ran on BoxingScene.com that stated that the return of former WBO light heavyweight champion Eleider Alvarez would return to the ring on June 28th at the Videotron Centre in Quebec. The fight would be the first for Alvarez since being dominated in a twelve round unanimous decision loss in his rematch against Sergey Kovalev in February in Arlington, Texas. Alvarez preciously knocked out Kovalev in August to win the title. BoxingScene.com recently spoke to Jesse Hart who confirmed that he is in the running to face Alvarez. “They told me that I was looking at June to return. I would love that fight. I have no problems facing Alvarez,” Hart stated. The Philadelphia native has campaigned at 168 for his entire career but is planning on moving up to 175 pounds for the fight. His promoter Top Rank is brimming with talent in the division having the rights to WBC champion Oleksandr Gvozdyk, IBF champion Artur Beterbiev and several options on Kovalev who holds the WBO belt. They also have Alvarez and former super middleweight Gilberto “Zurdo” Ramirez who will make his light heavyweight debut on April 12th. While he is interested in the fight, Hart doesn’t he should have to go to Alvarez’s backyard. The Colombian fighter lives in Montreal. “I already giving him the weight. I haven’t grown into the 175 pound division so I don’t see why I would have to go to his backyard. We can do that fight right here in the United States,” Hart told BoxingScene.com. Hart is coming off of a narrow December points loss to Ramirez. Both of his professional losses have come against Zurdo and if he is going to go into his opponents backyard he said they have to make it worth his while. “If they pay me enough I will go. Again I do t see why I should have to bit if they show me enough money then we can get it. Alvarez is already going to be 35. He’s at that age where he’s slowing down. I saw the Kovalev fight. Probably it’s getting hard for him to make weight. He didn’t have it in that fight. I can beat him even worse,” said Hart. This is a solid matchup and I wouldn't mind seeing it. This would be by far the biggest win of hart's career. Hopefully the old crook at top rank makes it happen. I like this fight! Its now or never for hart let's see what he can do at 175lbs it doesn't look promising considering he got thrashed twice by ramirez. alvarez is going to beat him. Bad matchup for Alvarez... I see another L looming.